Your Guide to Getting Through & Looking Good! I've always been a fan of festivals. From the small, outdoor, friend led one night events held on 'someone who knew someone's farm, to the iconic Gatherings of early 2000's, to taking the kids to Coachella - I have seen them all. Some (and I would say most) have been highly successful in terms of essentials I packed to get me through the long, late nights and endless days without decent showers and sleep. Others, were last minute, unorganised and left me dealing with a week of exhaustion. (Think Rainbow Serpent circa 2005 when temperatures reached high 40 degrees). Yikes! Everyone should attend a festival at least once in their life, to experience the myriad of music and magical vibes that brings people together. Some can be wonderful for kids, some are adults only events. But needless to say, some of the best times in my life have been hearing certain tunes on the grass dancefloor, and making life long friends at such events. I can now say, I am a bit of a festival veteran. We have our glamping tents, our buses, our portable phone chargers, our solar panelled showers attached to the sides of the tents which pop up magically when we whisk them out of their packs. While I realise most people will not have these luxuries while festival camping - here I have compiled a basic essentials list that will not only get you through the festival in one piece, but make you the enviable festival fashion princess of your chosen weekend event. If not, the most important aspect of festivals for me! Such fun dressing up for the weekend and don't hold back! Regardless of how tired I am, I still want to look my best, and it is absolutely essential that you pack items which are going to make your life easier and more comfortable after a cold wet hike back to your tent in the dark, and a terrible sleep being kept up all night with party goers. Shoes - No jandals (other than to walk to the showers with) Gumboots and boots only - especially the type without laces. Raincoat - Because you just never know. Take a handful of ponchos there is always someone you know who didn't bring one. Denim Shorts - YES! Pockets! Shirts - These are good, easily layerable and can be tied around your waist when needs be. Ditch the big puffy jackets unless you are not planning on doing any dancing and being a bar fly. HATS - The wider brimmed the better. That sun takes no prisoners. PJ's - Because if you're in a tent it really gets cold in the middle of the night! Don't forget something loose & comfy to walk to the showers with in the morning. MAKEUP! The fun stuff - glitter, metallic tatts, henna. Embrace your inner gypsy. I have had the most fun with this every festival and LOVE LOVE LOVE playing dress ups. Why not? HAIR - Leave the straightening irons at home. Think whispy, beachy - if you must tie it up have some fun with braids! Lace & Denim are always a good option. Tie Dye Why not? 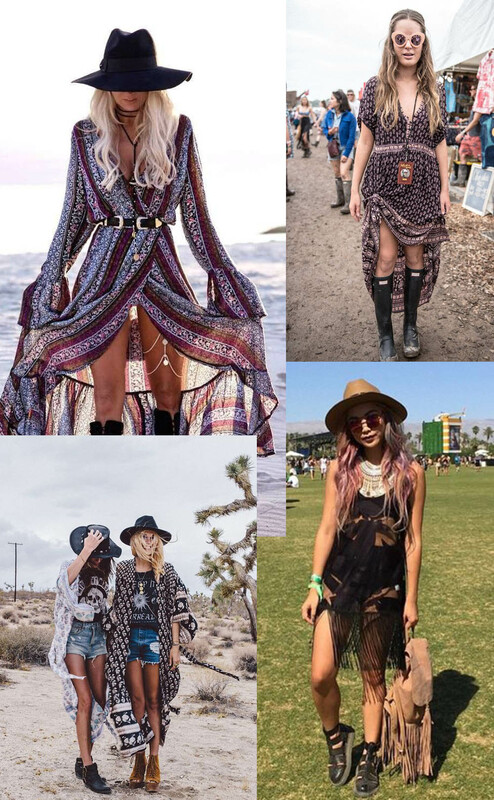 Spell have nailed this festival fashion & we always have a wide range in store which can easily take you from the city (minus the wedges and designer bags) to festival easily. Cute little dresses during the day that are not dance floor restricting! Check out our festival edit in the store here. * Wet wipes, toilet paper, hand sanitiser, deoderant, dry shampoo. Mini perfume, sunscreen. * Big 20 litre bottled water - you can refill your little bottles up from this. * Portable or solar powered phone charger. Torch!!! * Blankets or throws for during the day to set up a spot with your friends. * Jumper cables for the back of the car.